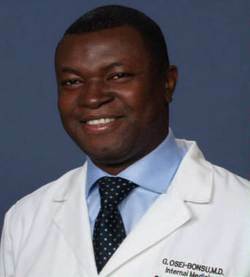 Dr. Osei-Bonsu is Board Certified in Internal Medicine. He completed his Internship and Residency in Internal Medicine in 2001 with the prestigious Columbia University College of Physicians and Surgeons in New York and has practiced Hospital Medicine in Greensboro for EaglePhysicians & Associates at the Moses Cone Health System over the past five years. As Site-Coordinating Physician, he provided treatment and consultation to acute hospital in-patients on a daily basis. Since 2005, Dr. Osei-Bonsu continues to hold the position of Medical Director of Wesley Long Hospital in Greensboro. Dr. Osei-Bonsu resides with his loving and supportive wife Rita and their three delightful daughters.